Is there an absolute way? 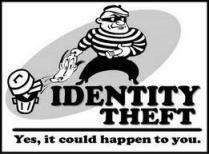 Let's look at how to prevent Identity Theft!! If we think of a house as an example – can you prevent a career criminal from breaking into your house? We can make it difficult for them, we can install alarms, locks and cameras and we could even go the extra mile and hire security experts and or armed guards. But, the truth is with all that technology in place someone who is determined will find a way to break in. We have plenty of examples in the news each day of companies who thought they had secured their company to find out that they had inadequate protection. The same is true for trying to prevent identity theft. We can make it more difficult, but nothing is 100%. The Big Picture. . . How to Prevent Identity Theft! It's hard to keep all your numbers and pass codes private. What's most important to keep to yourself and how can you do that?It may be impossible for you to keep all your information totally private; because every transaction you make to purchase goods or have a service completed you are sharing some personal information.However, why you can't eliminate opportunities for identity theft, but you can make it much harder for the thief. It’s key to understand how to best make identity theft prevention work. We will look at a number of key areas that can help you do a better job of preventing identity theft. Credit Card Fraud Tips – the eleven (11) do’s and five (5) don’ts regarding credit card fraud protection and how to prevent identity theft. Credit Monitoring – the mechanics of credit monitoring, how to get a credit report and what to look for, and how do you fix an error on the report. Fraud Alert – complete explanation of the different types of fraud alerts and how they work. How to Avoid Identity Theft – practical ways of how to avoid identity theft by looking at the home, the phone and the internet. How to Stop and prevent Identity Theft – how to stop and prevent identity theft and looking at best eight (8) practices that you should apply in preventing in stopping identity theft. Identity Theft Monitoring – whether you should look at Identity theft monitoring as a way to prevent identity theft. And what identity theft monitoring does and how it works. Identity Theft Security – ten (10) identity theft security tips in detail. Virus Protection Tips - nine (9) key virus protection tips that help keep your computer safe from identity theft. Wireless Security Guide - seven (7) key wireless security steps that help keep your computer safe and protected from identity theft.